Brass is a non-ferrous alloy made of copper and zinc. By varying the proportions of these two metals, the properties of the brass can be changed, allowing for harder and softer brasses. Brass has higher malleability than bronze or zinc but it is somewhat harder to hand work than copper and is usually used as an accent rather than the primary metal in weathervane making. The difference between brass and copper patina is subtle. Because both metals contain copper, they undergo a similar patina process. While each environment is unique, copper usually first turns a darker brown and then a beautiful turquoise green while brass first turns a slightly lighter shade of brown before weathering a slightly more forest green color over time. 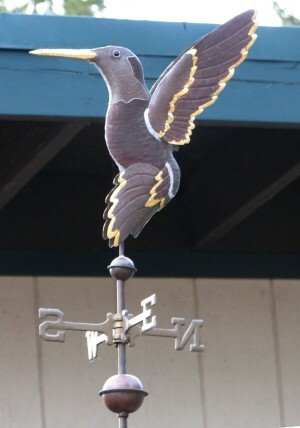 If you are looking for a subtle difference in coloration for your weathervane, brass accents in combination with copper is a popular way to go. Adding brass accents typically does not affect the price of the weathervane. In some cases, when a customer requests that we make a weathervane, such as a yellow Labrador Retriever, out of brass, there may be some up-charge because the brass is stiffer to work with and takes longer to fabricate. If you want a more pronounced difference in coloration, we recommend using optional gold or palladium leafing for the accents on your weathervane. In the Anna’s Hummingbird weathervane shown left, we have combined copper, brass and optional gold leaf. The copper on the back of the bird’s head, its belly, outer wing panel and inner tail panel, has weathered a rich chocolate brown. The brass of the Hummingbird’s face, Inner wing and outer tail panel, has weathered a lighter brown color. The Hummingbird’s beak and wing tips and tail tips have optional gold leaf applied. This weathervane has been outside and exposed to the environment for about 15 years. Eventually, the hummingbird should turn the lovely turquoise green and forest green color for which copper and brass are known, looking more and more like a real hummingbird as time goes by. Another reason we like to include brass in a weathervane design is because the solid cast directionals (North, South, East & West arms) included in the price of the weathervane are also made of brass. By adding some accent brass to the sculpture piece, it can visually unify the entire assembly.